The Manufacturing Technologies Association (MTA) and the University of Sheffield Advanced Manufacturing Research Centre (AMRC), have together created a feature at MACH 2018 demonstrating cost-effective adaption of Industry 4.0 Technologies by SMEs. The project was prompted by perceived implications among SMEs of high cost and complexity. The feature will demonstrate up to six separate manufacturing cells, replicating familiar manufacturing environments that have been integrated with Industry 4.0 Technologies. “The Integrated Manufacturing Group at [AMRC’s] Factory 2050 and we at the MTA understand that it is vital to cut through some of the jargon and hyperbole around Industry 4.0 and show first-hand the practical advantages Big Data can bring to an SME business,” said James Selka, CEO of the MTA. The influence of this holistic approach is apparent in the presentations of the major machine-tool builders. Productive complete machining, and ‘digital workflow’ are core issues for DMG MORI (Stand H20: 490). Its CELOS interface is a key element: first presented in 2017, digital workflows for data-supported production planning and automated tool management will be available for customers as CELOS early this year. Alongside this, 5-axis simultaneous machining is increasingly being developed as a key technology, with automation and combined milling and turning prominent. The DMC 80 FD duoBLOCK universal machining centre, with pallet changer, is said to be extremely rigid and capable of heavy-duty machining of rotating parts, for instance in aerospace applications. Grinding technology can be integrated, delivering surface finish of Ra < 0.3 µm. Efficiency and productivity are key themes underlying a sector-led approach from Yamazaki Mazak (Stands H20: 760, 790), which also presents its suite of Industry 4.0 solutions. The Mazak iSMART Factory works in partnership with SMOOTH Technology – said to be the world’s fastest CNC – to improve overall equipment effectiveness and facilitate data-driven manufacturing via the seamless connection of factory and office networks. Aerospace, one of these key sectors, is the principal market for the UK-built VTC-800/30SR, a vertical travelling column machining centre capable of full 5-axis contouring. The machine was designed for machining extremely long workpieces, or can be converted into two separate work areas, enabling pendulum loading and batch manufacturing. It has an 18,000rpm milling spindle, while a swivelling B-axis spindle head, in conjunction with the NC rotary table, offers full 5-axis simultaneous machining. Machines alongside include the HCR-5000S, developed for high-speed 5-axis aluminium cutting; and the INTEGREX i-400S, popular in the oil and gas industry for its large machining capacity. Several MACH debutants are presented by XYZ Machine Tools (Stand H18: 640). These include the LR and HD ranges of vertical machining centres; plus the UMC-5X gantry-style simultaneous 5-axis machining centre – the company arguing that it ‘moved the goalposts’ on price/performance ratios with this machine, available with either Siemens 840Dsl Shopmill or Heidenhain iTNC 640 HSCI control systems. Table configuration and machine design allow 500mm of Y-axis travel forward of the table when it is rotated 90° towards the rear, allowing larger workpieces to be machined. Matsuura Machinery (Stand H20: 542) will focus on automation and unmanned machining. The company’s pioneering tower pallet automation goes back over two decades, with the introduction of the MAM72 5-axis series. The latest MAM72-35V is equipped with 32 pallets as standard and up to 520 tools, for long periods of unmanned 5-axis simultaneous production. Citizen Machinery UK (Stand H20: 570) will reveal the next generation of its CNC system featuring touch screen and qwerty keyboard, as a key feature on the new Cincom D25-VIII and -VII sliding headstock turn-mill centre. Operational flexibility is maximised for complex cycles with two gang vertical toolposts each with X-, Y- and Z- axes and one with a B-axis capable of both front and back machining. The Cincom D25-VIII is configured as a 10-axis sliding headstock 25mm capacity machine which also incorporates the added flexibility of 0° to 135° swivelling B-axis. Moving into Phase 2 of its programme for Low Frequency Vibration (LFV) cutting technology, Citizen is also launching the Miyano BNA-42GTYLFV, a 42mm bar diameter hybrid development, moving headstock turn-milling centre. NCMT (Stand H19: 640) launches the Mecof UMILL 1500, a portal, 5-axis vertical machining centre with mill-turn and high-speed options. The company also presents the Okuma M460V-5AX vertical machining centre, the latest model, and the first 5-axis machine, in the Genos series. Highly rigid, thermally stable, double column construction is supported by Okuma’s Thermo-Friendly Concept applied to both machine structure and spindle. Other notable machining exhibitors include Heller (Stand H20: 470) where the focus will be the group’s worldwide drive towards integration of its machine tools and controls into the Industry 4.0 environment; Hurco Europe (Stand H6: 180), marking its 50th anniversary with the launch of two machining centres (cantilever design 5–axis plus 3-axis bridge type) and two new lathes; and Mills CNC (Stand H18: 520) showcasing 16 Doosan lathes and machining centres. Returning to MACH, Geo Kingsbury (Stand H7: 244) will present turning, milling and grinding technology from suppliers including Traub (single- and multi-spindle lathes) and Hermle (3- to 5-axis machining centres). Tornos (Stand H19: 312) will demonstrate its new MultiSwiss 8X26, equipped with eight spindles and eight slides for main operations accommodating up to three tools per slide. WNT – part of the Ceratizit Group (Stand H19: 500) will display cutting tool innovations alongside component examples, enabling visitors to relate products to applications. S-Cut UNI milling cutters feature a combination of an S-curve cutting edge and extremely irregular pitch. The geometry of this solid carbide cutting tool creates a variable helix angle, and an extremely smooth cutting action, which enhances tool life and surface quality, as fewer vibrations are produced during milling. Cutting data can also be increased to reduce cycle times. The irregular pitch of the cutting edges counteracts the induced vibrations – from tool to workpiece to machine tool – caused by entry and exit frequencies when making the cut. The irregular pitch also enables higher depths of cut at large angles of engagement. WNT recognises the growing importance of face-contact spindles with its BT-FC double contact toolholding system. A key benefit is the increased rigidity generated through taper and face contact, with the additional face contact counteracting any lateral forces, greatly reducing axial deviation. The design also enables extended spindle life and reduced vibration. Other cutting tool exhibitors confirm the value of integrated or targeted cooling. Horn (Stand H6: 890) launches its DA32 milling system with new, high-performance, diamond-tipped inserts. Highly positive insert geometry ensures a smooth cut, minimising stress on the workpiece and tool. Long cutter life and virtually burr-free machining are ensured, particularly on long-chipping materials. Coolant supply ensures targeted cooling of the cutting edges plus safe removal of chips. Also from Horn, its new grooving and parting off blades incorporate internal cooling and are designed for universal use in the production of small batch sizes. Floyd Automatic Tooling (Stand H20: 620) presents the latest line of Mikron Tool’s CrazyMill Cool products, developed for milling small dimensions. A new four tooth finish milling cutter with shank integrated cooling is available in 1-8mm diameter for depths of up to 5XD in hard materials. ITC (Stand H20: 650) will present new ‘micro milling’ product extensions; new indexable insert milling solutions from Widia; and product lines from BIG KAISER, the inventor of the BIG PLUS dual contact face and taper spindle system. Matsuura (Stand H6: 762) presents its hybrid 3D metal printing and CNC milling machine, LUMEX. In association with this, Oxford-based OGM, which purchased a LUMEX Avance-25 in 2017, offers a Hybrid Additive Manufacturing bureau service and has successfully used this technology to manufacture conformal cooling channels and injection moulding inserts with cycle time reduction and improved part quality. XYZ Machine Tools (Stand H18: 640) has been selected as an official reseller of the HP Jet Fusion 3D printing solution, which can print production-quality parts at speeds up to 10 times faster and at half the cost of comparable 3D printing systems. 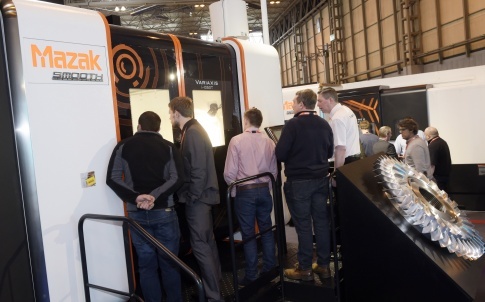 Renishaw (Stand H20: 150) will exhibit software and systems for producing metal parts; the RenAM 500M will be seen alongside demonstrations of QuantAM build preparation software. Renishaw will highlight the benefits of its four-laser system, which offers increased productivity in the most commonly used machine platform size. Renishaw (Stand H19: 430) believes that measurement data are essential to gather information enabling intelligent decision making, to prevent process variation; and that Industry 4.0 depends on connected systems, which are able to communicate, interpret and respond to information in real time. So, as well as exhibiting new and existing products, the company will demonstrate how measurement technologies can be integrated into a manufacturing process to achieve intelligent machining. A highlight is a high-productivity machining cell concept, with integrated process control; the principle is that by monitoring key process inputs, analysing data and continuous improvement, manufacturers can increase accuracy and productivity. Also to be shown are the latest multi-probe optical interface system which uses a spindle-mounted OMM-2C receiver to allow up to three machine tool probes to be installed with optical signal transmission; the latest scanning system for CNC machine tools; intelligent process control software for the Equator gauge; and apps to simplify machine tool probing. The company will also present a non-contact tool setter for machining centres; a multi-probe optical interface system; a new surface finish probe for use on the REVO 5-axis measurement system on CMMs; and enhanced software for the XM-60 multi-axis calibration system. Measurement specialists exhibiting also include Aberlink (Stand H19: 352), Faro (Stand H19: 140) and Hexagon (Stand H18: 430). Aberlink will be giving a MACH debut to the Xtreme 500 CMM. With a measuring range of 500 x 500 x 300mm, it is based on a hexapod design using linear motors and mechanical bearings. It maintains its accuracy at fast measurement rates and does not suffer from the accumulative dynamic inaccuracies that occur in conventionally designed CMMs. FARO will introduce a new portable CMM, the Quantum S Arm, which allows manufacturers to easily verify product quality by performing actions such as 3D inspections, dimensional analysis, CAD comparison, tool certification, and reverse engineering. Now with the FARO FAROBlu Laser Line Probe HD, the Quantum S delivers measurement consistency when performing both contact and non-contact scans; it enables users to capture more in richer detail at an increased speed. A nimble, large-scale portable laser scanner will be among products launched by Hexagon. The Leica Absolute Scanner LAS-XL offers a scan-line width of up to 600mm, measurement stand-off distance of up to a metre, and accuracy to within 150 microns. Hexagon says the expanded measurement field and point acquisition rate means components and assemblies such as large blade surfaces can be fully digitised faster than ever. Jones & Shipman (Stand H20: 875) represents all Hardinge grinding brands in the UK and at MACH 2018 introduces the Kellenberger 100 concept. 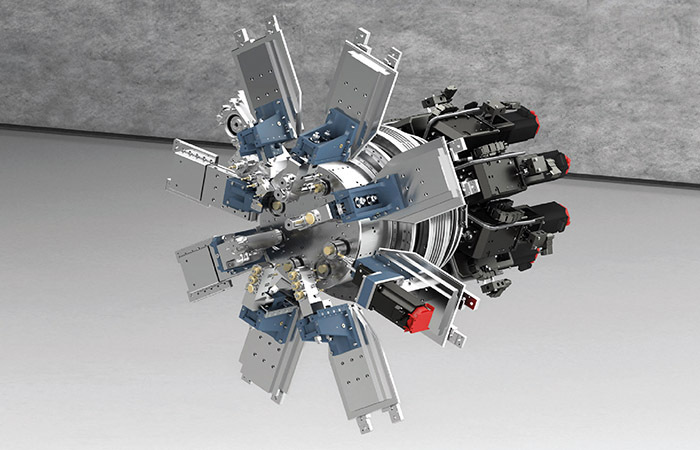 Modular configuration has helped to optimise costs; the machine shown will be the 1000mm between-centres variant equipped with a WeFlex automated load/unload system, which can be fitted to any Kellenberger 100 derivative. Also featured is the latest version of the UK-built Suprema Easy cylindrical grinding machine. This multi-purpose machine can process high-volume production grinding work or fulfil high-precision small batch quantities and one-off work (eg. in tool room or prototyping environments). A real advantage is the speed in the set-up of dressing and grinding cycles via specialist ‘Easy’ graphical grinding software, utilising touch screen technology. New EDM products from Sodi-Tech (Stand H19: 112) will include Sodick’s ALC400G wire eroder and an automated manufacturing cell combining the die-sink AG60L with an Erowa Robot. The ALC400G, incorporates Sodick’s latest digital innovations, including its Smart Linear and Smart Pulse technologies, in a small footprint machine; and is said to demonstrate significant advances in cutting speed, accuracy and surface finish, made possible through the use of Sodick’s 15 years of linear motor technology expertise. 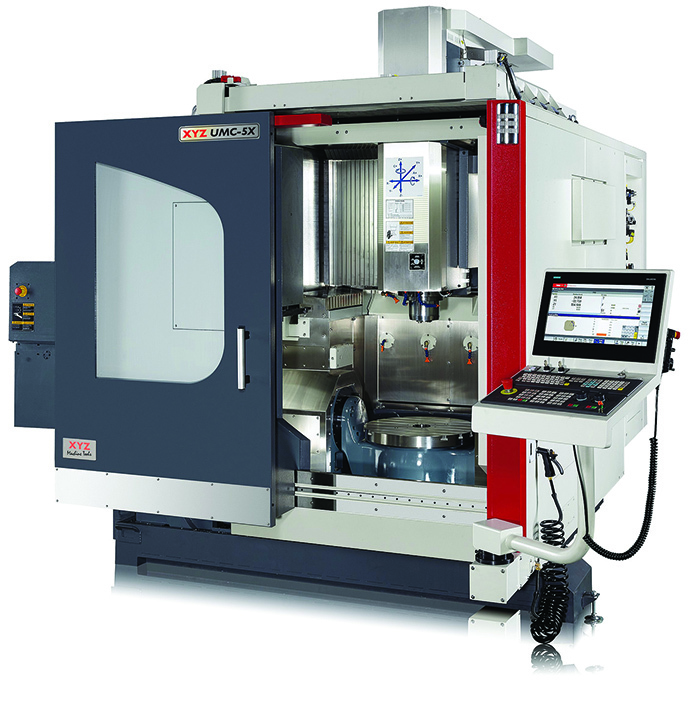 The AG60L is one of Sodick’s most popular die sink machines for precision machining large components. Three-sided automatic rise and fall work-tank makes the machine suitable for automation, hence its appearance at MACH 2018 with the user-friendly, small footprint Erowa Robot Compact 80. EDM machines on show from GF Machining Solutions, (Stand H20: 460) include two AgieCharmilles wire EDM machines – a CUT P 550 and a CUT 1000); and an AgieCharmilles FORM P 350 EDM die-sink machine integrated with a System 3R WorkPartner 1+ automation system. At the heart of the CUT P 550 machine is a new, intelligent IPG (Intelligent Power Generator) that improves cutting performance by 20 per cent. It also features a number of ‘onboard’ automation solutions that improve machine-tool utilisation and uptime as well as reducing operational costs. SolidCAM UK (Stand H17: 640) is set to open a new technology centre to enable customers to understand the complete manufacturing process. 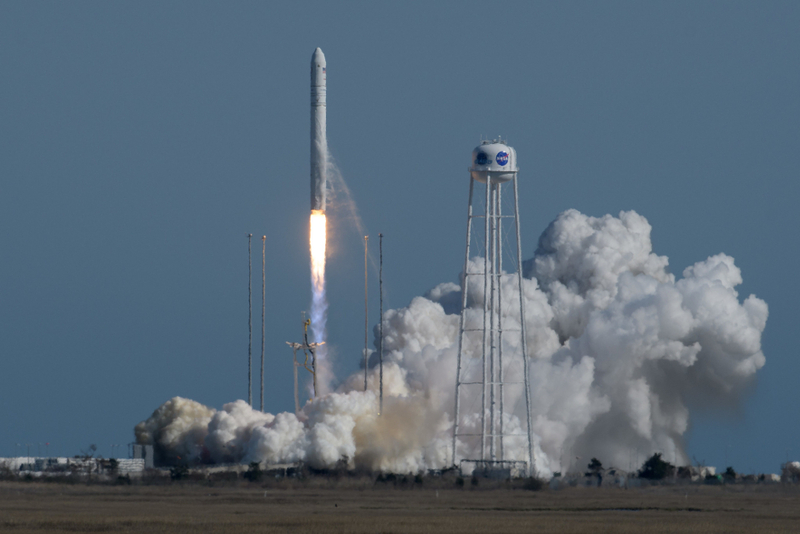 The company’s iMachining is said to be particularly effective on hard and difficult to machine materials such as Inconel and titanium; claims are made of speed improvements of up to 90 per cent. SolidCAM also incorporates powerful 5-axis machining and mill/turn capabilities, with limitless capability in terms of the number of axes it can control and synchronise. Open Mind (Stand H17: 620) will launch the latest edition of hyperMILL, Version 2018.2, providing demonstrations on how intelligent production can fit into the machine shop via the hyperMILL VIRTUAL Machining Center package. Built with Industry 4.0 in mind, the new simulation solution creates a virtual rendering of reality in the machine based on NC data; it generates a bi-directional communication link between the machine control and the hyperMILL VIRTUAL Machining Center. 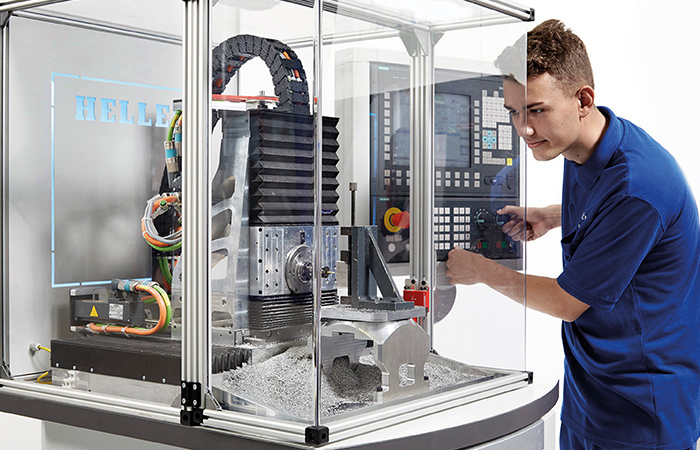 Central to its Industry 4.0 presentation, Heidenhain (Stand 18: 545) will demonstrate its Connected Machining system of production, in which all work steps are digitally networked via its TNC milling control. By linking the CNC system into a manufacturer’s network via Ethernet, design, programming, simulation and production planning staff as well as machinists on the shop floor are able to access all order and job-related information. And this is pretty much where we came in. The emphasis from the software and controls specialists underlines this year’s MACH message: look for efficient exchange of data right through to the production and despatch of components – and thus embrace advanced manufacturing driven by intelligence. From the archive: what was MACH like a hundred years ago?